Usually when it comes to standing up for Women’s and Gay rights Jeremy Corbyn is first in line to be heard. He is often very convincing too. Nevertheless, is it time we saw it for what it is? nothing more than virtue signalling, in order to pander to his hard extreme left cronies. There are some remarkable acts of bravery from women and gay people in Iran, and one Iranian woman wrote “death to the dictator” in red spray paint. A crowd burned a picture of the country’s late supreme leader Ayatollah Khomeini. While many stood up to the strong Revolutionary Guard. Dissent in Iran is not often tolerated, and it is a country where women are treated as second class citizens and gay men are routinely persecuted. Around 21 people have died in the anti-government protests across Iran, and we are yet to hear a peep from Jeremy Corbyn. Why? These points below may explain it. In February 2014 he spoke at an event in London held by the Islamic Center of England celebrating the 35th anniversary of the Islamic Revolution in Iran. 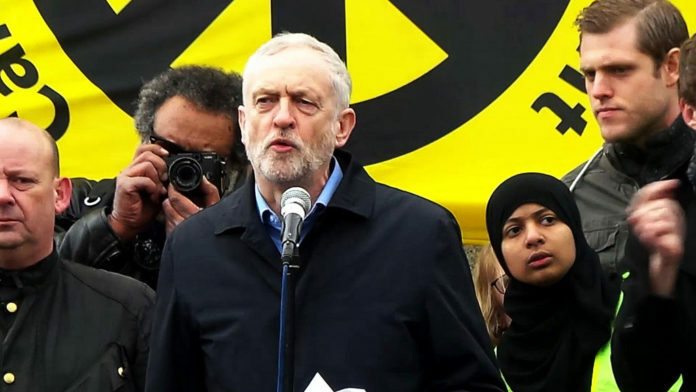 He spoke alongside Lord Nazir Ahmed, who was suspended by Labour for anti-Semitism in 2013. Also there was Iranian broadcaster Roshan Muhammed Salih who once called terrorist groups Hamas and Hezbollah “legitimate”. He accepted up to £20,000 (about $27,000) for appearances on the Iranian state broadcast network Press TV — a channel that was banned in the UK for its part in filming the detention and torture of an Iranian journalist. When will the hypocrisy from the extreme hard left stop? Are they a slave to their ideology?